When Alfred Hitchcock made The Man Who Knew Too Much (1934), he had come off of two consecutive failures, Rich and Strange (1931) and Waltzes from Vienna (1934), and was eager to return to the thriller genre. With screenwriters Charles Bennett and D.B. Wyndham-Lewis, he developed a story originally conceived eight years ago while on vacation at St. Moritz. Three more writers came on board at various points to contribute before Hitchcock was ready to shoot his film. The end result is one of the Master of Suspense’s classic early thrillers. Bob (Banks) and Jill (Best) Lawrence are on vacation in Switzerland with their young daughter Betty (Pilbeam). They’re a posh couple with a spoiled child – she’s hardly chastised for causing a ski jumper to wipe out at the end of his run. During dinner, while dancing together, the Lawrences witness a political assassination, which embroils them in a web of political intrigue when Betty is kidnapped by a gang of spies led by a creepy man named Abbott (Lorre). As always, Hitchcock knows how to ratchet up the tension as evident in the tense phone call Bob and Jill have with the kidnappers and their daughter. The director focuses on Jill in a close-up and Edna Best expertly conveys the fear that her character feels as she worries about her child’s safety. Hitchcock also expertly orchestrates scenes where he puts the protagonists in danger, like when Bob goes to a dentist he believes has ties to the kidnappers and is almost put to sleep permanently by the doctor, only to get the upper hand. The Lawrence family are rather non-descript protagonists – no where near as complex as the ones in Hitchcock’s Hollywood films – which allows Peter Lorre’s deliciously evil hitman to walk away with the film. With the distinct scar that runs along the right temple and his big, sleepy eyes, the famous character actor conveys a casual menace. Initially, he doesn’t seem like much of a threat, but as with Hitchcock, looks can be deceiving. 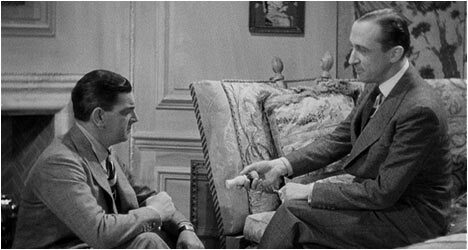 While Hitchcock’s Hollywood remake of The Man Who Knew Too Much (1956) has eclipsed the original – and rightly so for it’s the better film – the 1930s version has its merits, most significantly, Lorre’s performance. The film revitalized the director’s career and he followed it up with The 39 Steps (1935), proving that he was most at home with plot twist-infested thrillers. There is an audio commentary by film historian Philip Kemp. He points out that The Man Who Knew Too Much launched Hitchcock’s international career and provided the blueprint for subsequent films. He cites a quote from the director who claimed that this one was his “first real film.” Kemp puts the film in the context of Hitchcock’s career and briefly examines its origins. Naturally, he talks about the casting of Lorre and analyzes his performance while also giving a brief biographical sketch. This is an informative if not slightly dry commentary track. Filmmaker Guillermo del Toro, a dedicated Hitchcock fan, talks about The Man Who Knew Too Much’s importance and why he admires it, even preferring it over the ’56 remake. Del Toro points out that Hitchcock was really up against it at the time he made the film and had a lot riding on it. He provides intelligent and succinct analysis of key scenes in the film. “The Illustrated Hitchcock” is a 50-minute television program from 1972 that features an interview with the famous director. He talks about some of his favorite techniques and a few of his trademark cinematic motifs. He’s candid about his issues with Method actors and his obsession with blonde actresses. “Hitchcock and Truffaut” features audio excerpts from lengthy conversations French New Wave director Francois Truffaut had with Hitchcock. These particular excerpts focus on The Man Who Knew Too Much. Finally, there is “Restoration Demonstration,” which briefly examines the work that went into meticulously restoring Hitchcock’s film to its original glory. The folks at the Criterion Collection found a decent print but needed to use a machine that wouldn’t damage the fragile stock.